Valentines is coming up! Are you ready? I have a fun idea for your special someone. 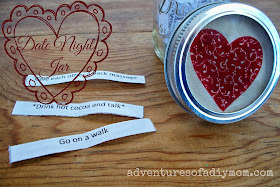 A date night jar or box. I made a date night box for my sister and her husband for Christmas. Inside the box was a jar with strips of paper with date night ideas on them. Also in the box, I included different items to help with their date nights. For example, one of the strips said "Play a game", so I stuck in a card game. You can take this idea and make it as simple or as elaborate as you'd like. I wanted the ideas to be things that would cost little or no money. Here's a list of what date nights I gathered. For the starred items I also included something to put in the date night box to help accomplish the date. I really wanted a years worth of dates, but I couldn't think of any more that I thought they would actually do. What other ideas would you include in your date night box? Leave a comment and I'll add them to the list.